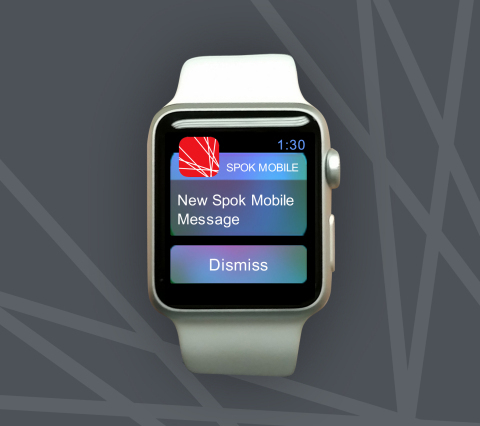 Spok, Inc. announced today the availability of message notifications on the Apple WatchTM wrist wearable device to enable clinicians to enhance care coordination. The Spok Mobile(R) secure texting app is currently used by numerous hospitals to give users quick access to the organization’s directory, allowing staff to communicate securely through encrypted text, image, and video messages. In addition, the app can receive alerts from patient care, nurse call, and other monitoring systems to speed response to critical situations. Already a leader in clinical mobile technology, Spok currently provides flexible communication options for a range of devices, now including the new Apple Watch. Spok, Inc., a wholly owned subsidiary of Spok Holdings, Inc. (NASDAQ:SPOK) , headquartered in Springfield, Va., is proud to be a leader in critical communications for healthcare, government, public safety, and other industries. We deliver smart, reliable solutions to help protect the health, well-being, and safety of people around the globe. Organizations worldwide rely on Spok for workflow improvement, secure texting, paging services, contact center optimization, and public safety response. When communications matter, Spok delivers. Visit us at spok.com or find us on Twitter @Spoktweets.